Your partner might have been harbouring dreams of getting fit, toning up or losing weight for quite a while. Perhaps you do, too. That’s why we’re offering a fantastic Valentine day gift idea: a personalised gift card that can be emailed to the recipient of your choice on February 14. Our sessions are designed to keep you achieving more, week by week, allowing for effective, wide-ranging results and plenty of recovery time between sessions. All clients receive training matched to their fitness level. We’ll be mixing cardio, strength training, speed and agility with our programme of bodyweight exercises and beyond. All Plans includes ongoing nutritional support and motivation and safety guidance on appropriate solo training. Mobile personal training that’s perfect for weight loss, toning and strength as well as general fitness. 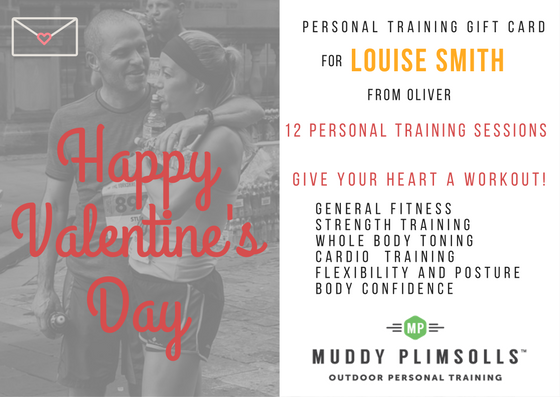 Brilliant personal trainers available across London. Debit and credit cards accepted. Convenient monthly billing and savings on 3 – 6 month training. VISIT OUR ONLINE SHOP TO LEARN ABOUT ALL THE OPTIONS OFFERED ON OUR GIFT CARD. Drop us an email (info@muddyplimsolls.com) to get started. Offer covers personal training across London. For further afield, please enquire.